SwizzTool is a handy tool which contains several utilities which reside in the system tray. 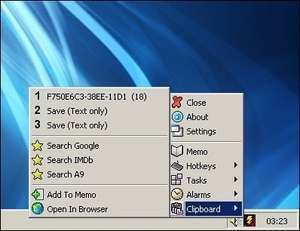 All of the programs can be accessed by right clicking the SwizzTool icon from the system tray. Among the utilities are alarms and reminders, system commands, direct access to web pages, access to programs, clipboard management and many more. Just like a Swiss Army Knife, SwizzTool provides many features. For security reasons, you should also check out the SwizzTool download at LO4D.com which includes virus and malware tests. Additional screenshots of this application download may be available, too.